And surprise: It's based on WWII-era naval tactics! With Facebook recently changing its terms of service to use the algorithmic likeness of your face, and with the ongoing jubilee of NSA news, there’s been renewed interest in thwarting facial recognition algorithms. According to Wired, a Dutch artist and designer now claims to successfully confuse Facebook’s algorithms with a special kind of t-shirt. But first, a history. In the past half decade, artists have experimented with computer vision dazzle camouflage, or “CV dazzle.” CV dazzle seeks to obstruct and confuse cameras or other computer sensors to keep them from detecting people. When they detect a face in a photo or search for a human heat signature, computers are looking for certain patterns; confuse those patterns, and they don’t know there was a human there. Though William Gibson prophesied about “the ugly t-shirt,” a shirt so ridiculous its wearer would be invisible to surveillance cameras, the artist Adam Harvey invented the term “CV dazzle.” Harvey’s work is the best known. Tim Maly (a friend of ours here at The Atlantic tech channel) spoke to him in January for Wired about his anti-drone garments and shawls. My favorite work of his, though, may be his anti-facial recognition make-up and hair-dos. 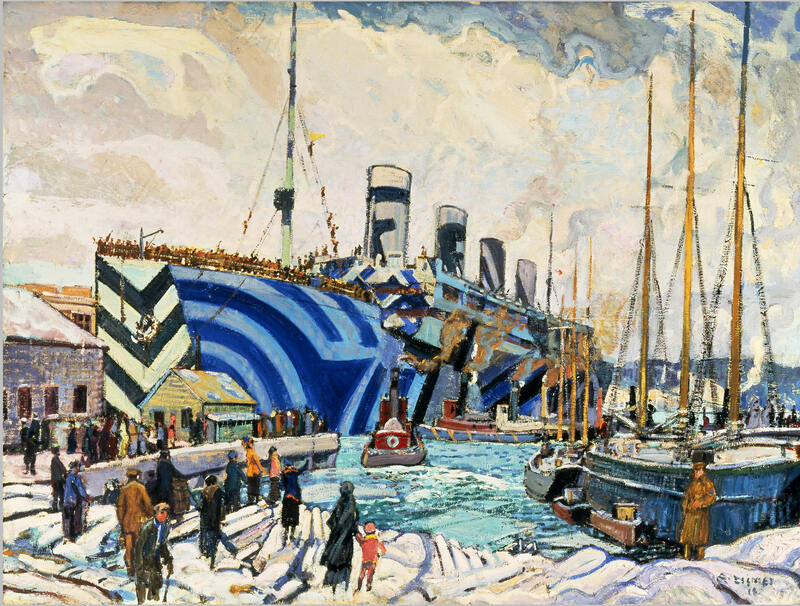 A 1919 painting by Arthur Lismer of the Olympic, a Canadian troop ship outfitted with dazzle camouflage. Dazzle takes its name from a type of naval camouflage (and otherwise) used in the world wars. Huge, jarring stripes were painted on ships, less with the intent to conceal them in the water and more with the idea of disorienting enemy weapons and maneuvering. CV dazzle applies the same concept to algorithms. Harvey’s work is amazing. I adore this male ’do and make-up; I may have dreamt of the day something like it will appear in some thumping, ominously globalized music video. But, like, look at it! Do you know how much time getting downward-facing spikes like that takes in the morning? And that pixelated make-up? Every morning? Oy vey! Maybe it’s better to acclimate yourself to the omnipresent eye of Total Surveillance than the daily toil of a blowdryer and göt2B Glued. 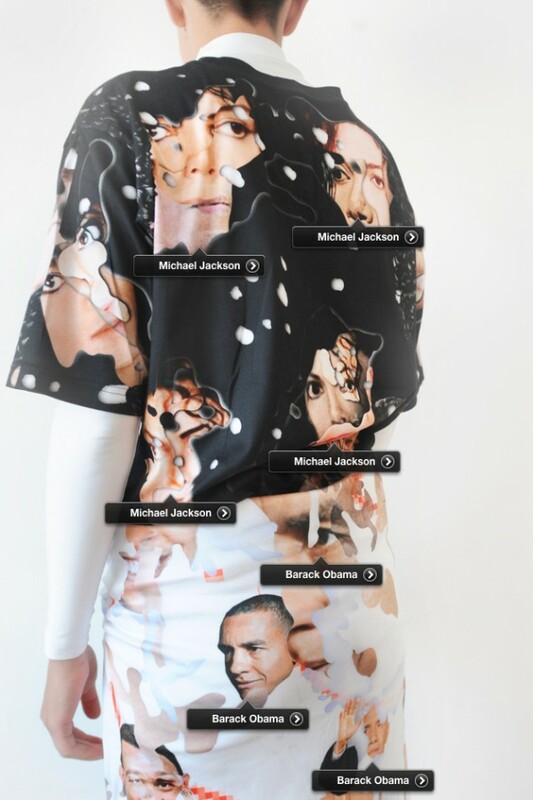 Enter Simone C. Niquille, a designer and artist based in Amsterdam. Her REALFACE Glamoflauge t-shirts apply dazzle camouflage techniques to the everyday t-shirt. The shirts are part of her larger art project, exploring how digital technology augments and affects faces — one of her projects is “Chin+,” a physical chin-extruder meant to create more imposing video chat face. “I was interested in creating a tool for privacy protection that wouldn’t require much time to think in the morning,” Niquille said. The t-shirts are custom-printed, but they’re printed, not manufactured. They can be ordered online, from a website that’s got something of its own dazzle print, right now. And they’re not just decorated with any old human face: The visages of celebrity impersonators cover the shirt. It’s a nice touch. The faces on your shirt aren’t just meant to convince a computer of something — they’re meant to convince a human of something, too.